We all hear the buzz around using social media tools for learning and collaboration in the workplace – but what we really need is practical tips for implementing those technologies every day. At OpenSesame, we use a number of social technologies to enable communication and collaboration. Social media is particularly essential for us because more than 40% of the OpenSesame team works remotely. It’s important to us to make sure our remote team members feel as included and involved in the office culture as the team here in Portland. We’ve experimented widely with different technologies to work and stay in touch with distant team members, and after extensive experimentation we have adopted Google+ Hangout as our primary line of communication. Why? Hangouts allow up to 9 team members to video chat with each other in conjunction with multi-user video rooms. In addition, you can also share your screen or work collaboratively on a Google Doc. Everyone already has a Google account (we run our company calendar and email through Google Apps), so it doesn’t require anyone to create additional accounts. It’s instant to set up and works in the browser, so no one has to download any desktop apps (like you would with GoTo Meeting, for example). It enables you to adjust the video quality transmitted in order to optimize your video quality to the bandwidth you have available to you. It’s simple, instant, and, of course, free. 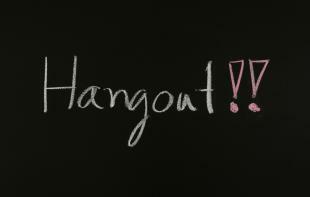 How can Google+ Hangouts support your team? To create a sense of presence for remote employees, OpenSesame remote team members stay logged into the Google Hangout throughout the day, and the home office features five dashboard screens mounted on the walls. This allows us to walk up to the screen to converse with our lead software engineer in Miami and our business development manager in Des Moines – and allows them to experience everything happening in the office just like they’re in the room with us. Including the Harlem Shake. In addition to just face to face discussions, we share our screens to teach each other how to do something on the site, discuss new designs for courses or product pages, and brainstorm new blog posts or marketing campaigns. Even better, we can switch instantly from video chat to screenshare to a Google Doc – with no clumsy loading time or delay. To hold company, group, and one-on-one conferences. To complete product demos for customers. To discuss proposed product designs. To share computer screens and documents to collaborate on projects. OpenSesame thrives in our virtual community. We deploy various applications like Google+ Hangout for fast and easy communication across departments. This kind of closeness ensures that remote employees don’t miss out on the casual conversation, joking and spontaneous brainstorming that makes a company more nimble and creative. For more social media application suggestions, look at the 5 Ways to Start Using Social Media for Training. Have you used video chat to communicate at work? Share your experiences with us in the comments!